I am currently a student in the University of Washington Masters of Infrastructure Planning and Management (IPM) program. This quarter I am taking IPM501, Comprehensive Emergency Management. 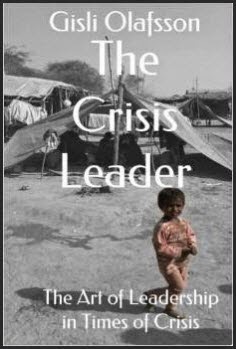 As part of this course one of our required readings is an excellent crisis leadership book by Mr. Gisli Olafsson entitled The Crisis Leader. We were very fortunate to "virtually meet" Mr. Olafsson on an Adobe Connect lecture on July 29th where Mr. Olafsson took 90 minutes to highlight his experiences as an urban search and rescue leader including his experience as a team leader for Iceland's International Urban Search and Rescue team (ICE-SAR) immediately after the tragic earthquake hit Haiti in 2010. In summary he used this equation as a way to help capture some key aspects of personal leadership. You need to know yourself -- you need to know how you react under times of stress and crisis and how you deal with events -- including those events with substantial amounts of death and destruction. You need to understand your emotions, fears and how to deal with these psychological arrows so you can be an effective leader. Mr. Olafsson pointed out that key to the "You" aspect is to realize that you need to trust your team and their capabilities in order to control and even block your fear. You need to be prepared for the task at hand by knowing your own strengths and weaknesses. You also need to be physically and psychologically fit to endure the long hours and stressful conditions. Paramount elements for leadership success includes being resilient (also referred to as "Semper Gumby" as a reference to the very flexible cartoon character). Secondly, you need to always be preparing through planning and exercising..
Mr. Olafsson noted that as a rule of thumb from a World Bank document on Natural Hazards Unnatural Disasters that for every hour or preparation spent you can expect to save six hours of effort; similarly for every dollar spent you can expect to save six dollars. You want to build your team so that you are a "...leader of leaders..." where the team members are empowered to not only do their job but also to fill the role as a leader as required for the situation and based on their technical specialties/expertise. Don't be a micromanager but lead your "leaders" so they are effective and the job gets done. Response to a crisis is a key reason why you are at the disaster. But, you are surrounded by many challenges ranging from the disaster itself to the weather to the debris field to the emotional survivors and even to the smell. First you need to focus -- block the external stimuli and do your task at hand. Secondly, take advantage of the intelligence and help that can be provided by the local population affected by the disaster. Apparently FEMA in the U.S. refers to this concept as "Survivor-centric Response." Your ability to understand how the situation is affecting people..."
If you are a leader of any sort -- but especially one placed -- or potentially placed -- into an emergency situation or worse yet a disaster, I would highly recommend you take time to read, digest and contemplate the excellent and field-proven advice offered in this book by Mr. Olafsson. As a 40+ year leader myself, I found his advice to be "...right on..." and useful for my professional and personal leadership roles.